Seven persons were killed and 13 others seriously injured early on Tuesday when a SUV Cruiser rammed into a stationary tempo on the Latur-Nanded Road and another oncoming SUV, an official said. LATUR: Seven persons were killed and 13 others seriously injured early on Tuesday when a SUV Cruiser rammed into a stationary tempo on the Latur-Nanded Road and another oncoming SUV, an official said. 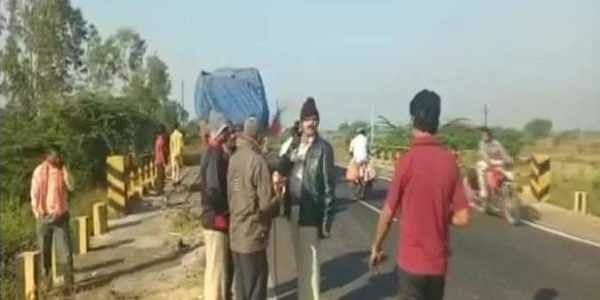 The accident occurred at 5 a.m. near Kolpa village, around five km on the outskirts of Latur town. According to police official B.N. Jagdale of Vivekanand Police Station, the Cruiser SUV had picked up eight passengers to drop them at Latur Railway Station to catch a morning train. En route on the Latur-Nanded Road, the speeding Cruiser rammed into a tempo with a punctured tyre which was parked beside a small bridge, and then hit an oncoming SUV on the same road with full force, Jagdale told IANS. The roof of the SUV Cruiser was ripped off due to the impact of the accident, and the vehicle badly crushed, killing seven passengers in it and injuring four others. Nine occupants of the other SUV (also a Cruiser) sustained injuries. All injured were admitted to Latur Civil Hospital, around five km from the accident site, he said. The deceased have been identified as Manoj C. Shinde, 24; Tukaram N. Dalvi, 35; Umakant Kasle, 46 and his wife Meena, 40; Shubham S. Shinde, 20 - all from Latur. Besides them, the others killed included Dattu B. Shinde, 29 of Nanded and Vijay T. Pande, 22 of Nashik. The bodies have been sent for autopsy.